When Bourne took the position, Washington Post media critic Erik Wemple, who almost took the editor spot at the Voice himself at one point, told us, “The only way to go is to appreciate the resources you still have, not bemoan the resources that the paper once had.” But what the Voice still has, at this point, continues to shrink, even after the paper had layoffs, lost its editor, and was spun off last year. Update: Gawker hears that legendary gossip columnist Michael Musto might be among those staffers on the chopping block. “The proposed changes do include minimal staff reductions, and directly align with the long-term growth strategy of Voice Media Group. 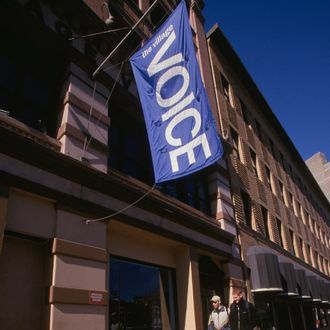 They will ultimately support the ongoing sustainability of the Village Voice.” Pete Kotz, who used to run* the company’s True Crime Report, will be in charge in the interim. *Correction: Kotz is no longer the editor of True Crime Report, as previously stated.